Gilead: Does it pass the trial as a long-term investment? I like the biotech industry for two reasons: one is the moral benefit of knowing you are investing in a good cause, and the other is the prospect of momentous returns, as is the case with Gilead Sciences (GILD). Nevertheless, I am usually deterred by the volatile nature of this industry, in which companies’ profits depend on trial results, approvals, and patent durations. So I’ve been keeping tabs on Gilead for a while now, since the launch of its blockbuster Hepatitis C drug Sovaldi last December, though I’ve never quite had the nerve to invest in it. However, when its stellar second quarter earnings rolled around during my stint at Stock Rover, I was propelled to do some further research. An excellent second quarter, along with the first FDA approval of one of its oncology drugs, Zydelig, makes it no surprise that GILD’s price only continues to trend higher. As seen in the chart above, GILD (dark blue line) has seen its price climb 250% over the past two years, from $25 to $90. Its growth far surpasses that of the Biotech industry as a whole (light blue line), and even more so, that of the S&P 500 (in red). The orange line represents Gilead’s Relative Strength Index (RSI) which is currently around 57. Even with its strong stock performance, the RSI is not particularly high, which means GILD is not overbought. Note that a value of 80 or above generally represents a stock that is overbought. To further highlight the rapidity of its growth, in just in the past 3 months alone (charted above), GILD has seen a 23% increase in price. In fact, Gilead exhibits higher returns (above) than the other major players in the Biotech industry, with a whopping 320% 3-year return. With two quarters of excellent results under its wing, Gilead was doing a top-notch job of convincing me to venture into the daunting, yet intriguing world of biotech, but before I made a move, there were a few questions I felt needed to be addressed: Now at a high point, does GILD still present a good opportunity for investors to buy? And does it have the potential to be a strong long-term candidate? Beyond Sovaldi, how will Gilead grow? With these questions in mind, I commenced my research. Gilead Sciences is a research-based biotechnology company that discovers, develops, and commercializes new drugs with the aim of addressing the unmet medical needs of patients living with life-threatening diseases. Its main areas of focus are HIV/AIDS, liver diseases such as Hepatitis B and C, cancer and inflammation, and severe respiratory and cardiovascular conditions, though it has an extensive pipeline that spans across several disease categories. It has special expertise in infectious diseases and the development of single-tablet regimens that are safer and more convenient for patients. First, for context, I decided to compare some valuation metrics between GILD and some of its large-cap peers in the biotech industry, shown in the table below, to see if the stock lives up to the hype. GILD’s P/E and EV/EBITDA land comfortably in the middle of the pack. 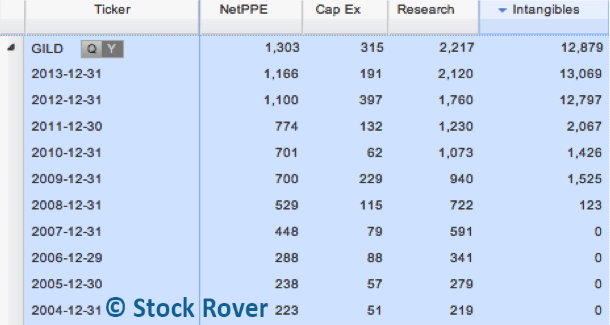 Its P/E multiple seems pretty high compared to the market, but the biotech industry is known for notoriously high P/Es. Most significantly, GILD has a very low forward PEG of 0.5, nearly half that of the average for the Biotech industry of 0.97, which implies extremely high next year growth. While its valuation combined with its momentum suggest that Gilead is a lucrative stock to invest in for the next year, I’m thinking about the longer term. Let’s look at its growth stats to see what is driving its extremely low PEG forward. 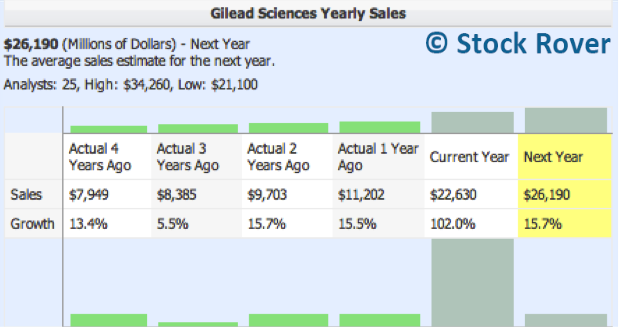 Gilead expects to see a whopping 102% increase in sales this year, driven by the approval of Sovaldi in December 2013 (I’ll elaborate on Sovaldi’s story later on). After the one-time impact on sales from the release of Sovaldi, which established a higher baseline, its next year sales revenue is expected to normalize to 15.7%, similar to its rates of the past two years. Gilead’s EPS growth (below) mirrors its sales growth, and the fact that its EPS is growing faster overall than its sales tells investors that its sales growth is getting to the bottom line in an efficient manner. The EPS for the current year is expected to more than triple last year’s EPS, growing 234.8%. For the next year, it is expected to increase at a still very fast 22.1%. Gilead’s EPS saw a dip in 2011, in part due to its acquisition of Pharmasset, the company that developed Sovaldi, for $11 billion, though its current year growth proves that the acquisition has more than paid off. Its bumpier EPS growth is a testament to the protean nature of biotech stocks. Though they have been higher in the past, these numbers have collectively increased since 2012. Since Gilead has a history of acquiring smaller pharmaceutical companies to expand its pipeline and also must funnel a lot of capital into R&D, these fluctuations are quite natural. Still, it’s good to see a trend of growth across the board in recent years, as this means its investments are now beginning to convert to profits. So far, it’s looking to me like Gilead is performing exceptionally well, but for a final confirmation, let’s peruse its financial statements. Gilead’s income statements, shown below, look very healthy. Its margins, similar to its capital efficiency numbers, have been climbing since 2012, and even despite small fluctuations, they have been consistently high. GILD has also seen its sales increase at a much faster rate than its costs of sales. Gilead’s balance sheet, below, is a bit more of a mixed bag. It has been growing its cash, but it still has more long-term debt than cash, and its debt/equity ratio is a bit on the high side of the Biotech Industry average of 0.5. For an explanation, let’s see where Gilead’s money is going by looking at its Net Property, Plants, and Equipment (NetPPE), Cap Ex, Research, and Intangibles. The table above shows that Gilead is channeling more than double its cash into Intangibles, which makes sense as it has been continually acquiring companies with new drugs to bolster its pipeline. It is also putting a significant sum of money into Research and Development, primarily to develop its oncology pipeline and grow its HIV pipeline. Gilead has also seen increasing selling, general and administrative (SG&A) costs from the launch of Sovaldi in the U.S. and abroad, as well as the expected launch of its new drug, Zydelig (more on this later). Moreover, Gilead has repurchased $6.65 billion in shares over the past four years to ramp up its shareholder value and plans to continue with this strategy. Still, with its cash catching up to its debt and sales picking up, Gilead’s balance sheet should only get better. 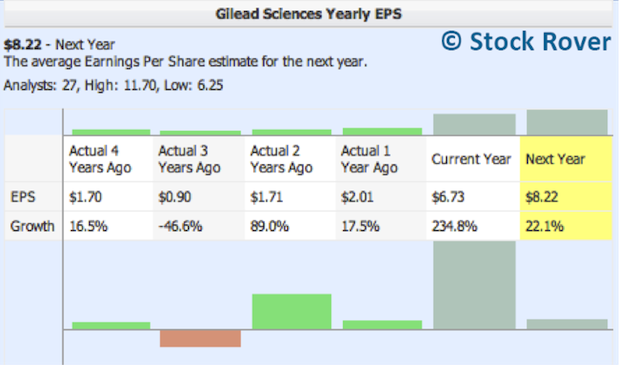 The numbers tell us that Gilead is a great value, even at its current price, and will continue to see growth into 2015. In addition, they show that Gilead is making increasingly efficient use of its capital and seeing improving margins, which means it will be in good shape to carry out future growth initiatives. Yet, to answer the question of whether Gilead has long-term potential, I had to do a further enquiry into its business. Gilead has a 10-member board with an independent lead director. Its management team is composed from a diverse set of skills and backgrounds, including many scientists. Chairman and CEO John Martin, who holds a Ph.D. in organic chemistry, was the previous director of antiviral chemistry at competing pharmaceutical company, Bristol-Myers Squibb. President and COO John Milligan, Ph.D. joined Gilead in 1990 and was named the top biotechnology industry CFO in the U.S. by Institutional Investor magazine for three years straight. Gilead’s accomplished management team has a track record of smart acquisitions and decisions that have greatly added value to its business, which makes me confident that they will continue to successfully grow Gilead in the future. Gilead built up its business with the success of its single pill HIV treatment regimens, the first to hit the market, which now represent a $9 billion business and serve 85% of treated HIV patients in the U.S. A single pill regime means that patients are less likely to miss doses and develop resistance and also only need to pay one copayment, increasing both convenience and affordability. The tenofovir disoproxil fumarate (TDF) molecule lies at the heart of all of its single-tablet regimens (Viread, Truvada, Atripla, Complera, Stribild), but scientists are currently in Phase III (final stage) testing for tenofovir alafenamide fumarate (TAF), a next-generation molecule that has proven to be more potent than TDF in smaller doses, reducing toxicity. TAF, which has a good chance of being approved, will allow Gilead to maintain its dominance in HIV. Truvada, approved in 2004, is the first once-daily oral pill to reduce the risk of acquiring HIV in high-risk adults, and it has seen very good results so far. Stribild was approved by the FDA in 2012 and showed similarly effective results to Atripla with less severe side effects in a Phase III study. It generated $539 million in sales in 2013, up from $58 million in 2012. In addition, Gilead manufactures AmBisome B, an antifungal agent for life-threatening fungal infections in AIDS patients including cryptococcal meningitis. As a caveat, AmBisome’s patent will expire in 2016. Gilead has a strong cardiovascular drug portfolio as well, with Letairis for pulmonary arterial hypertension,Ranexa for chronic angina, and Lexiscan, a coronary vascodilator. Letairis saw its sales increase 27% to $520 million in 2013, and Ranexa saw its sales increase 20% to $449 million. Gilead’s respiratory drugs include Cayston, an inhaled medicine for cystic fibrosis that was approved by the FDA in 2010, and Tamiflu, an orally administered drug for influenza A and B that is marketed by Roche. Gilead received $134.7 million in royalties from Roche for Tamiflu in 2013. The downside is that Tamiflu will see its patent expire at the end of 2017. On the same day its 2Q earnings were released, Gilead got FDA approval for its first oncology drug idelalisib, marketed as Zydelig, a kinase inhibitor that could treat chronic lymphomatic leukemia (CLL), relapsed non-hodgkins lymphoma (FL), and relapsed small lymphocytic lymphoma (SL). With an estimated 200,000 or more Americans living with CLL, FL, and SL, Zydelig could represent a valuable revenue channel for Gilead. However, the drug comes with a boxed warning of serious side effects that was not imposed by the FDA on competing drug, Imbruvica, which might affect sales. Gilead’s miracle drug Sovaldi is the first all-oral, interferon-free treatment for Hepatitis C infections. Not only does it have an over 90% cure rate, it has a one-time treatment period of only twelve weeks and reduces side effects from interferon injections. However, it carries a hefty price tag of $1,000 a pill, or about $84,000 for the full treatment period in the U.S, which has led to much media and government scrutiny. CVS-Caremark and ExpressScripts have both reported in public statements that they will take steps to rein in the high cost of covering Hepatitis C drugs. Despite the buzz, Sovaldi is actually fairly priced when taking into account historical pricing patterns and the overall cost of previous, longer-term Hep C treatments. Since its launch in December 2013, Sovaldi has already been prescribed for more than 80,000 patients in the U.S. and Europe and has cured an estimated 9,000 patients to date. These patient numbers, which should also increase with time, help to justify Sovaldi’s pricing. Morever, Gilead applied for the approval of Sovaldi in Japan in June and should see approval by mid-2014; this represents a huge market, as there are around two million people living with Hep C in Japan. Increasing competition is also bound to bring Sovaldi’s price down a notch — AbbVie, Bristol-Myers Squibb, and Merck each have their own all-oral Hep-C drugs on the line. Merck, in particular, has been doing trials with combination drugs that could lower the treatment period down to four weeks. However, in its second quarter earnings conference, Gilead also reported possible two- and three-drug combinations that could increase the cure rate to virtually 100% and shorten the duration period to four to eight weeks. Furthermore, Sovaldi is currently awaiting the October 10th FDA express approval of a fixed-dose combination tablet of Sovaldi and ledipasvir for genotype-1 patients that has even higher efficacy rates and the potential for an 8-week treatment regimen. With 3.2 million people infected with Hepatitis C in the U.S. and about 150 million people worldwide, Hep C drug sales could potentially rake in $20 billion annually until 2020, so it is no surprise that Gilead is facing a horde of fierce patent battles. But despite these hindrances, most analysts still believe that Sovaldi will come out on top; after all, it is still the nearest to being the perfect Hep C drug. (Here’s an in-depth comparison of Sovaldi and AbbVie’s upcoming all-oral Hep-C regimen). At the second quarter conference call, President and COO John Milligan stated, “We feel very, very confident in the pipeline we have today, so our focus will be on selective deals in order to augment our pipeline in certain key areas.” Indeed, Gilead has an impressive pipeline with several drugs in or past the Phase III stage. Some highlights are the Phase 2a success of respiratory syncytial virus drug GS-5806, encouraging Phase II results for the combination of Ranexa with Sanofi’s Multaq for patients suffering paroxysmal atrial fibrillation, and positive Phase I data for GS-6615 to treat long QT-3 syndrome, a cardiovascular disease. One drug to watch out for is Simtuzumab, currently in Phase II, which treats idiopathic pulmonary fibrosis as well liver fibrosis in non-alcoholic steatohepatitis (NASH) patients. Since NASH affects 2-5% of Americans, the market for it is quite large. In addition, Gilead is continuing to acquire companies to expand its pipeline, especially in the areas of cancer and pulmonary disorders, including Arresto Biosciences and Calistoga Pharmaceuticals (for idelalisib) in 2011 and YM Biosciences in 2013, amongst others. Gilead is continuing to improve upon previous drugs and developing new drugs, which gives evidence that its business can grow past 2029, when the last of its current drug portfolio meets its patent expiration date. Despite the riskier nature of biotech stocks, Gilead’s solid performance to date, its promising pipeline of drugs in all the major disease categories, and its talented team, management and scientists alike, have convinced me that it is a long-term buy. In the coming few years, Gilead will no doubt see strong growth bolstered by Sovaldi sales as well its stronghold in the HIV market. Further into the future, it is difficult to predict whether the company will hit upon another Sovaldi or not. Nevertheless, I am of the opinion that Gilead will continue to see success, both as a business and a stock.